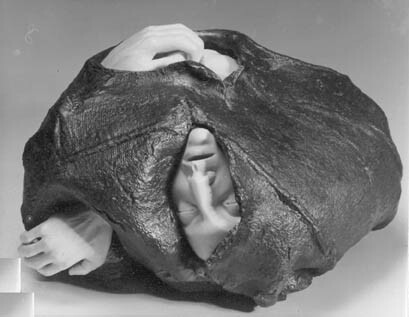 The work on a whole fragment of mammoth tusk set bounds to artists as it was limited in size by nature. 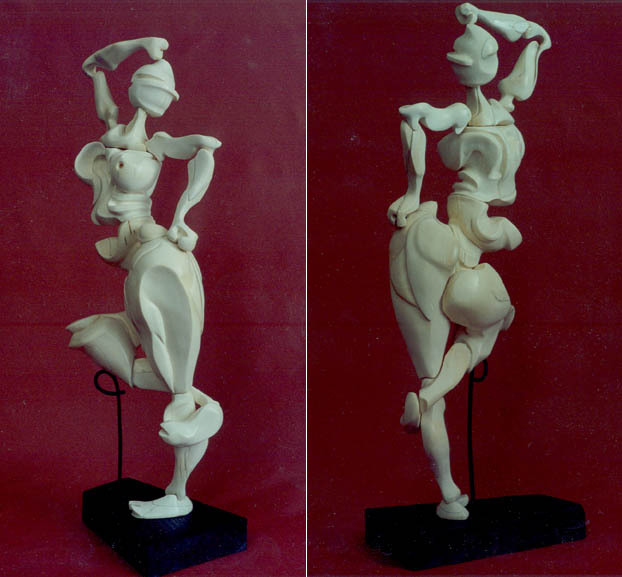 Anyhow, Valeria Mokeeva found the way out for her creative ego when she took up the chrysoelephantine techniques in sculpture. Valeria and her school combined mammoth ivory with metal and wood to achieve stunning results. It is for the first time in the history of Russian bone carving that artists could use monumental compositions to embody the world of their experiences, emotions and subconscious associations. 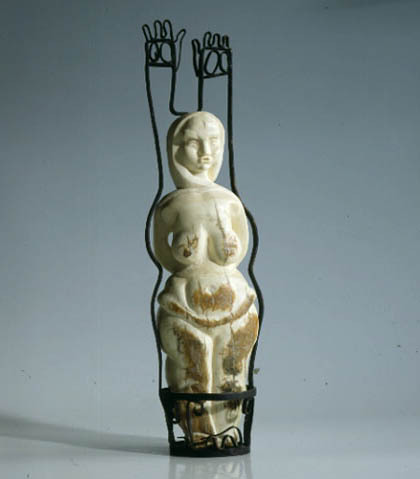 Thus, owing to Valeria Mokeeva, Russian professional avant-guardist bone sculpture was born. It was highly estimated by experts in Russia and Europe at the exhibitions in the Hermitage and Moscow Kremlin, as well as at the festival fairs of contemporary art in Moscow and Copenhagen. 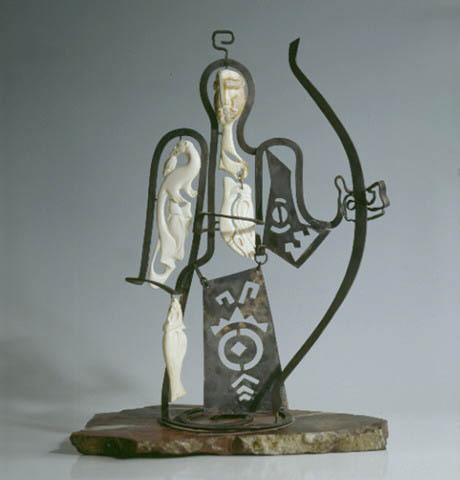 Some of the works by Mokeeva and her school were bought for the collection of the Moscow Kremlin Armoury. The main principle of Valeria Mokeeva and her avant-guard school is freedom and independence in art, unconstrained by any bounds. Due to this, you will get absolutely independent, valuable works of new Russian chrysoelephantine sculpture. International art fair ART&nbspMIF&nbsp93. Moscow. "Vivat, St. Petersburg - Gifts for Ambassadors", Petropol Gallery, St. Petersburg. "Rose and Life-Giving Cross", State Hermitage and the Petropol Gallery, St. Petersburg. International festival of contemporary art ArtGENDA'96, Copenhagen, Denmark. "Rose and Cross", Moscow Kremlin Museums. 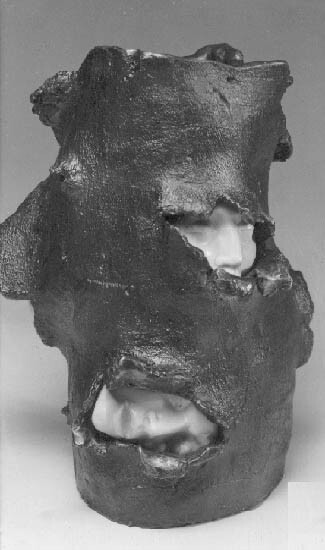 "The Ancient Cleft", International art fair ART&nbspMANEGE'97, Moscow. Series "The realms of the hell"
From the visitors' book of Petropol Gallery, 1994. 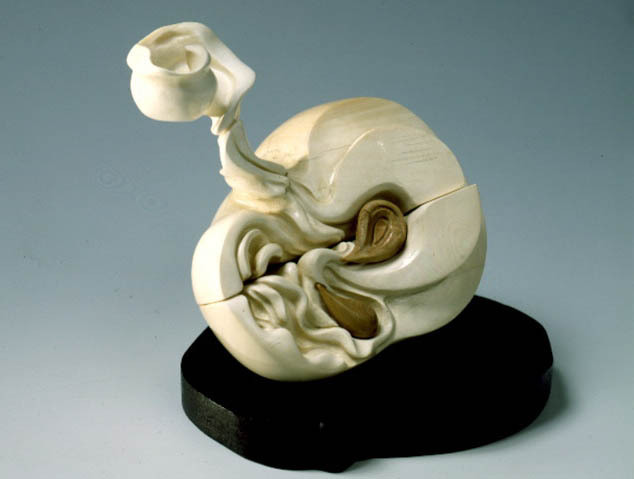 It is not by chance that Valeria Mokeeva gave "the second birth" to mammoth ivory. Originated from the old Northern Russian carver family of Lopatkin, she got used to intent look at the modest palette of her native landscape, not so very diverse but capable to form an immaculate taste. 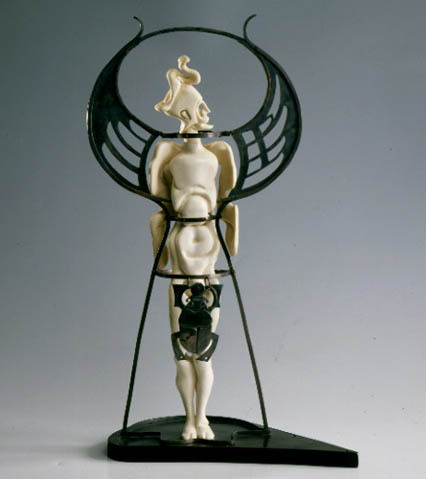 In her creative activity Mokeeva has managed to glorify quite ordinary material, horn, which, in her hands, becomes a variety of fabrics and laces in the attire of coquettish girls of 19th century, enlivened in miniature sculptures... 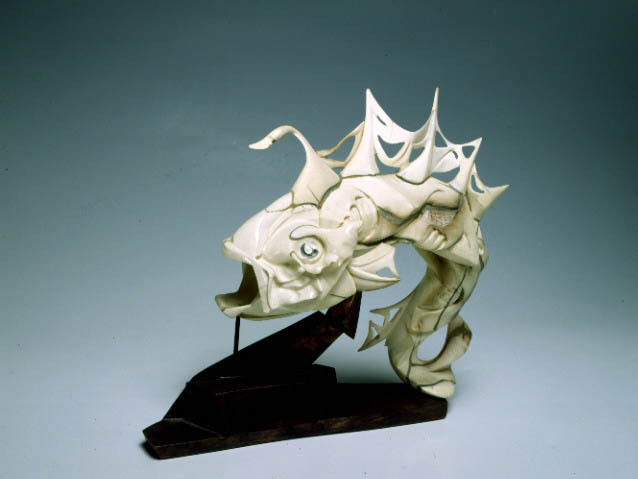 The professional sense of colour in Mokeeva immediately reacted to the picturesque character of mammoth ivory. Under her cutter the material became alive, playful and made a real feast of hues and tints. Not only an artist and organiser, but also a talented teacher, from the first days of her creative activity (since 1982) started Valeria Mokeeva to develop different forms of art education. 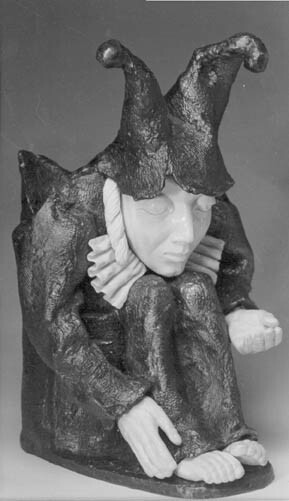 For 13 years of her teaching activity, Mokeeva gave a start to artists who have already made their names famous in arts, like Alla Antsiferova, monumentalist sculptor, a student of renowned Mikhail Anikushin; Mikhail Korshikov, the winner of "Summer- Show-92" (parallel to Mokeeva's school, he finished an evening class of graphics in the Academy of Arts); Olga Manusbayeva, now the head of the bone-carver school in the far-off Anadyr; Andrey Budilov, an alumnus of Mukhina Academy of Arts (a class in metal), who presents in the exhibition his first works where mammoth ivory combines with rough metal details. Once again the unbreakable links between the two capitals, Moscow and St. Petersburg, is demonstrated by the exhibition of the masterly art of bone-carving, which is symbolically named by his organisers "The Rose and the Cross". The talented artists of Petropol Gallery exhibit their beautiful sculptures of mammoth ivory in Moscow Kremlin. ... Animating the pages of the native history, the Petropol Gallery artists use the experience of their predecessors in quite bold and unexpected projects. The slogan of this direction is the refined "Rose" that symbolises the heyday of Russian artists. 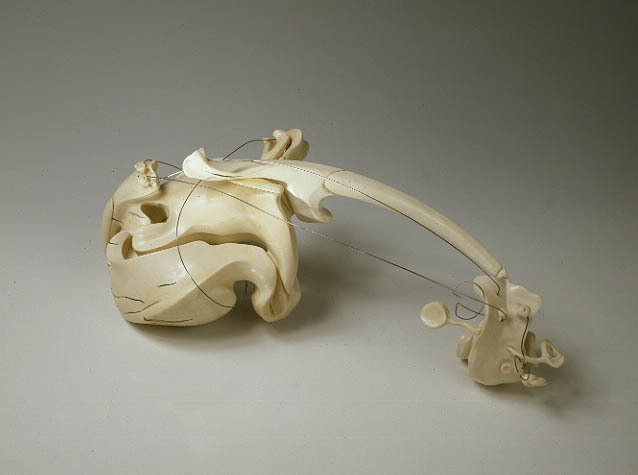 Sculptors are very skilful in combining mammoth ivory with other materials in their works, in particular, with bronze, horn and stone, which emphasises the extreme aesthetic resources of mammoth ivory. The creative quest of Petropol Gallery are supported by the leading Russian museums. 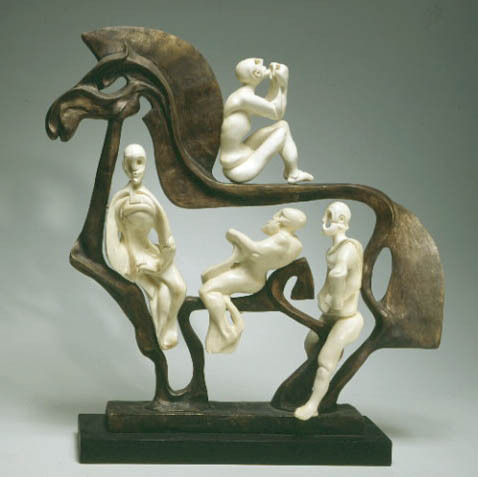 The State Hermitage Museum and Moscow Kremlin do not only provide their rooms to exhibit the best works of the Gallery, but they also buy the works of contemporary St. Petersburg sculptors for their world-known collections. The new exhibits will be displayed in the luxurious interiors of the Patriarch Palace, the architectural pearl of the Kremlin, and in the Armoury.